Summer is going by way too fast. How blessed is the man who does not walk in the counsel of the wicked, nor stand in the path of sinners, nor sit in the seat of scoffers! But his delight is in the law of the Lord, and in His law he meditates day and night. 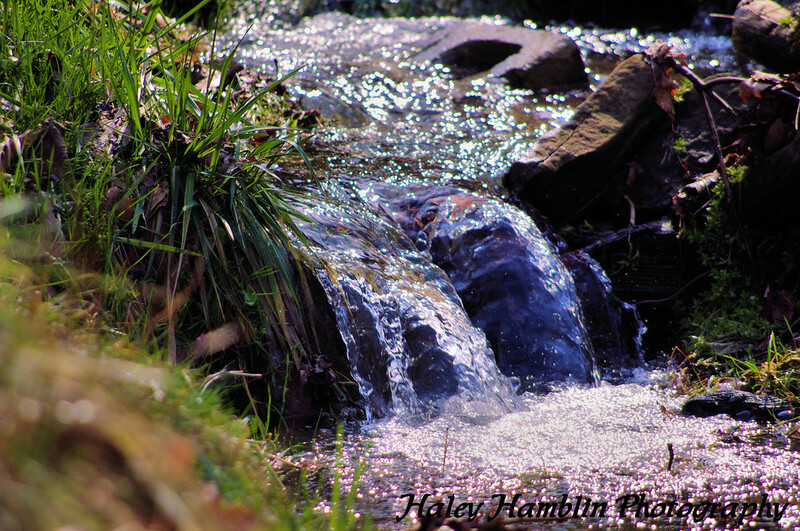 And he will be like a tree firmly planted by streams of water, which yields its fruit in its season, and its leaf does not wither; and in whatever he does, he prospers. The law of the Lord is perfect, restoring the soul; the testimony of the Lord is sure, making wise the simple. The precepts of the Lord are right, rejoicing the heart; the commandment of the Lord is pure, enlightening the eyes. The fear of the Lord is clean, enduring forever; the judgments of the Lord are true, they are righteous altogether. They are more desirable than gold, yes, than much fine gold; sweater also than honey and the drippings of the honeycomb. Moreover, by them Thy servant is warned; in keeping them there is great reward. Who can discern his errors? 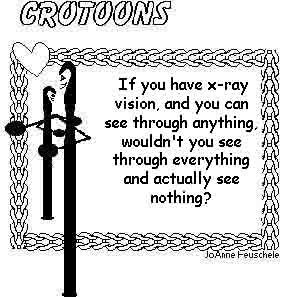 Acquit me of hidden faults. Also keep back Thy servant from presumptuous sins; let them not rule over me; then I shall be blameless, and I shall be acquitted of great transgression. Let the rods of my mouth and the meditation of my heart be acceptable in Thy sight, O Lord, my rock and my Redeemer. This you know, my beloved brethren. But let everyone be quick to hear, slow to speak and slow to anger; for the anger of man does not achieve the righteousness of God. Therefore putting aside all filthiness and all that remains of wickedness, in humility receive the word implanted, which is able to save your souls. But prove yourselves doers of the word, and not merely hearers who delude themselves. For if anyone is a hearer of the word and not a doer, he is like a man who looks at his natural face in a mirror; for once he has looked at himself and gone away, he has immediately forgotten what kind of person he was. But one who looks intently at the perfect law, the law of liberty, and abides by it, not having become a forgetful hearer but an effectual doer , this man shall be blessed in what he does. If anyone thinks himself to be religious, and yet does not bridle his tongue but deceives his own heart, this man's religion is worthless. This is pure and undefiled religion in the sight of our God and Father, to visit orphans and widows in their distress, and to keep oneself unstained by the world. MEDITATING ON THE WORD WILL FEED IT ." Who is the ruler of demons? 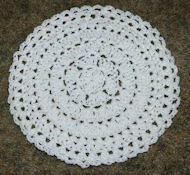 Traditional crochet patterns are written using crochet abbreviations while charted or graphed crochet patterns give a listing of materials along with a graphed picture of the project. When a graph is involved your project can be somewhat intimidating since the pattern isn't actually written out. Be patient and read over your graph before you begin your pattern. Determine which direction you need to read each row. Make a note on the chart... drawing an arrow in the direction you are to read each row will help you not be confused. I will need to pick it up again on the way back for the next row. can take away from the photo clarity. I suggest using a separate strand for each side so the black won’t have to be carried across so many stitches. This will save yarn and keep the black from showing through too much. As for having a right side/wrong side issue... the only way to clear up that problem is to work all of your graphed rows from one side, cutting the yarn at the end of each row. Fridgie patterns make great additions to scrapbook pages. Combine the two crafts for an excellent result. 88. I use my scrap yarn to make baby rattles. I found a cute little bird pattern that is just a small tube. I add the beak, wings and stitch eyes on (nothing that can be pulled off). I then stuff the little bird part way up. For the rattle part I take two water bottle caps, place a few beads or dry beans in one cap, place the other on top and secure them together with masking tape. I place the "rattler" in the bird and finish stuffing. I crochet a few more rounds and before closing I take a few small pieces of yarn of different colors and place them in the hole on top. I sew the top closed, ensuring the "hair" is sewn in securely. Unravel the hair so it looks all frizzly. Voila! An adorable little birdy rattle. I donate the rattles to the local charity for new moms and babies. 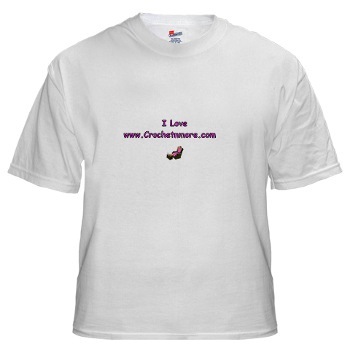 They charity gives them away to all the mommies. A great recycling project too! I am a new subscriber from the little big town of Grand Rivers in west Kentucky. Thanks for the patterns and ideas. do you have number 89? Thank you so much for taking the time to reply! I appreciate it so much!! The little hats are so adorable and people have seen mine and just love them! I use them quite often in my own kitchen and can't imagine cooking anymore w/out them. I also thought about weaving a ribbon of some type through the hat to make a little bow on them. Again, thank you so much. Have a great and safe 4th of July!! I just wanted to say thank you. I started learning how to crochet a little over a week ago and your sight and patterns have really helped me. Your patterns are easy to follow and give a sense of actually doing something while still learning. 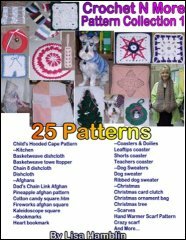 I USE TO BUY PATTERNS LIKE THESE FROM CHRISTINES PATTERNS IN WILKES BARRE, PA BUT SHE HAS RETIRED. ANY HELP??? 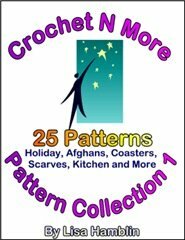 Are you looking for patterns for character dolls OR afghans? I just wanted to let you know that last night before I went to bed I was reading through your tips and I found quite a few of them extremely helpful and have already put some of them to use. I am marking my rows as I go, also I am putting a stitch marker in every 10 stitches. I know that these two (2) techniques are going to be very helpful for me because right now I am in the process of making a hand made snuggle that has 143 stitches per row and the body of this project is 87 rows high so with me marking each row as I go and putting in a marker every 10 stitches will help me keep track. Thank you again. Also, I can’t wait to read more tips as they are released. color completely and weave that yarn tail in... then join the new color. Hi, I am in the process of finishing this darling little tote and am having problems visualizing exactly where to stitch the handles.Do you happen to have a larger picture of the tote? 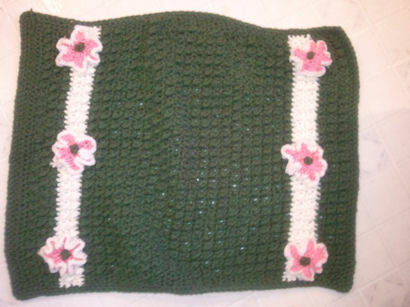 Handle #1 is crocheted onto the main tote. Once it is finished you fasten off the end leaving about six inches of yarn to sew that end to the main tote. To attach that end you skip five stitches on the last row of the main tote and sew Row 11 (the last row you made) of that handle to the main tote. For Handle #2 you chain six and work a double crochet in the fourth chain from the hook. Double crochet in each remaining chain. You should have 4 double crochet stitches. Now repeat Row #2 of Handle #1. Rows 3-11 of Handle #2 are the same as Rows 3-11 of Handle #1.
from Handle #1). Sew Row 1 of Handle #2 to the main tote. Now skip 5 stitches and sew the opposite end of the handle to the main tote. The best way I can explain how to position Handle #2... is sew it to the main tote adjacent to Handle #1. They should line up with each other. you to give me the stich count on it. To make this beanie larger you would need to increase again like in R3. Join with sl st in top of beg ch3. Do not turn. You can also change to a larger hook size for a more subtle change in size. Hello, I'm new to this and kind of old. My grandmother tried to teach me when I was younger and I am now trying to take it up again years later. I have read and reread your very good instructions on reading a pattern, but I am still confused. And I am just starting out. Row 1:(dc,ch2, dc)in sixth ch from hook,*skip next 2 chs, (dc,ch2,dc) in next chain; repeat from*across to last 3 chs, skip next 2chs, dc in last ch:32sts and 15 ch2 sps. there are 3 chains left. Skip the next 2 chains. Double crochet in the last chain. When the row is finished you should have 32 stitches and 15 chain 2 spaces. 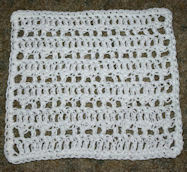 crochet stitches on the rows. Oh my guess i best get to crochets i have a little boy that would love these. Thank you so much for explaining the pattern so clearly. It's time for spring cleaning again! an essay with the title 'If I Were a Millionaire.'" "I'm waiting for my secretary," he replied. My mom got mad at my dad the other day and went shopping to relieve her irritation. When she returned home she informed him that she had purchased ten new dresses. "Ten!" he hollered, "What could any woman want with ten new dresses??" My mom calmly replied, "Ten new pairs of shoes." card for me? My arthritis is acting up and I can't even hold a pen." there anything else I can do for you?" The old fellow glanced at the card a moment and said, "Yes, at the end could you just add, 'PS: Please excuse the sloppy hand-writing?'" When I stopped the bus to pick up Chris for preschool, I noticed an older woman hugging him as he left the house. "Is that your grandmother?" I asked. "Yes," Chris said. "She's come to visit us for Christmas." "How nice," I said. "Where does she live?" "At the airport," Chris replied. "Whenever we want her, we just go out there and get her. My wife has not spoken to me in three days. I think it has something to do with what happened on Sunday night when she thought she heard a noise downstairs. She nudged me and whispered, "Wake up, wake up!" "There are burglars in the kitchen. I think they're eating the tuna casserole I made tonight." "That'll teach them!" I replied. an old leaf from a tree that had been pressed in between the pages. With astonishment in the his voice, he answered, "It's Adam's Suit!" My mom got mad at my dad the other day and went shopping to relieve her irritation. When she returned home she informed him that she had purchased ten new dresses. A site foreman had ten very lazy men working for him, so one day he decided to trick them into doing some work for a change. "I've got a really easy job today for the laziest one among you," the foreman announced. "Will the laziest man please put his hand up." "Why didn't you put your hand up?" the foreman asked the tenth man. "Too much trouble," came the reply. Airstream trailer pulled up beside them. Keith was salivating at the thought of owning one when his three- year-old daughter weighed in. "I guess they can't afford a tent," she said. husband stood up and shrugged saying, "This doesn't feel so bad." The instructor then dropped a pen and asked the husband to pick it up. "Honey, pick up that pen for me." his friends burst through the door. "Hey, Dad, announced Ben. "Have you met the new neighbors"? "Come on, Dad, you have to meet them." "Some other time. I'm busy." "Dad, you have to meet them now." my project and went to the front of the house. No one was there. "Where are they"? I asked.